Here’s one you don’t see every day – or almost ANY day! 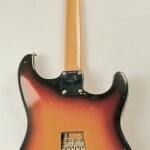 A beautiful 1971 Sunburst Stratocaster® – that is a lefty, has a very desirable maple cap neck AND is very light – SEVEN pounds on the nose. These are hard enough to find – but one this light is a real find. Please call for pricing, more details and additional pictures.